Troye Sivan Mellet (/trɔɪ sɪˈvɑːn/ TROY sih-VAHN; born 5 June 1995), is a South African-born Australian singer, songwriter, actor, and YouTuber. 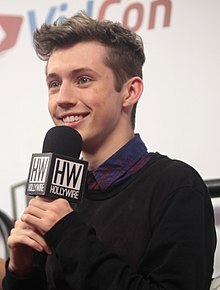 After gaining popularity as a singer on YouTube and in Australian talent competitions, Sivan signed with EMI Australia in 2013 and released his debut extended play, TRXYE (2014), which peaked at number five on the U.S. Billboard 200. Its lead single, "Happy Little Pill", reached number 10 on Australian music charts. In 2015, he released his second extended play Wild followed by his debut studio album Blue Neighbourhood, whose lead single "Youth" became Sivan's first single to enter the top 40 of the Billboard Hot 100 chart, peaking at number 23. His second studio album Bloom (2018) reached number three in Australia and number four on the Billboard 200 chart. Its lead single "My My My!" became Sivan's second number-one single on the Billboard Dance Club Songs chart. As an actor, Sivan portrayed the younger version of the titular character in the 2009 X-Men film X-Men Origins: Wolverine and starred as the title character in the Spud film trilogy. As a YouTube personality, Sivan used to upload video blogs regularly and, as of 2016, has over 4 million subscribers and over 241 million total views. His video, "The 'Boyfriend' Tag", with fellow vlogger Tyler Oakley earned them a Teen Choice Award in the "Choice Web Collaboration" category. In October 2014, Time named Sivan as one of the "25 Most Influential Teens of 2014". In 2018, he received a Golden Globe nomination for Best Original Song for "Revelation", from the film Boy Erased, in which he also had a supporting acting role. Sivan was born in Johannesburg, South Africa, the son of Laurelle and Shaun Mellet. His family moved to Australia when he was two years old due to rising crime in South Africa. Sivan grew up living in Perth, Western Australia with his parents and three siblings Steele, Tyde and Sage. His father is a real estate agent and his mother is a homemaker. He is Jewish; his father was born to a Jewish family and his mother converted to Judaism. Sivan attended Carmel School, a private Modern Orthodox school, until 2009 when he started distance education. Sivan's musical career started when he sang at the 2006, 2007 and 2008 Channel Seven Perth Telethon. His 2006 performance included a duet with Australian Idol winner Guy Sebastian. Sivan made it to the finals of StarSearch 2007. His debut EP, Dare to Dream, was released in June 2007. In February 2010, Sivan opened "We Are the World 25 for Haiti (YouTube Edition)", the collaborative music charity video produced by Lisa Lavie to help raise money for the victims of the 2010 Haiti earthquake. His most recent hit "Youth", from his Blue Neighbourhood album that he released in 2015 reached number 23 in the billboard Top 40 single. On 5 June 2013, Sivan was signed to EMI Australia, a Universal Music Australia label, but kept it a secret until a year later. On 15 August 2014 he released a five-song EP entitled TRXYE, led by its first single "Happy Little Pill", which was released on 25 July 2014. TRXYE debuted at No. 1 on iTunes in over 55 countries. The album debuted at No. 5 on the Billboard 200 the following week, scoring Sivan his first Top 10 album. "Happy Little Pill" peaked at number 10 on the ARIA Singles Chart and was certified gold by the Australian Recording Industry Association for shipments exceeding 35,000 copies. Sivan released his second major-label EP, Wild, on 4 September 2015. The EP was supported by a music video trilogy entitled Blue Neighbourhood, comprising the three songs "Wild", "Fools" and "Talk Me Down" and released from September 2015 to December 2015. Additionally, the EP served as an introduction to his album Blue Neighbourhood, which was released on 4 December 2015. Sivan supported his debut studio album Blue Neighbourhood and his EP Wild with his first tour, 2015's Troye Sivan Live. Sivan further supported his debut studio album with 2016's Blue Neighbourhood Tour and Suburbia Tour. On 26 May 2017, Troye collaborated with Martin Garrix to produce the song called There for You. On 10 January 2018, Sivan released the single "My My My! ", along with an accompanying music video. He confirmed that his second album was inspired by his boyfriend, an American model named Jacob Bixenman. The song is a notable contrast from his earlier work, with Pitchfork commenting on his "assured" vocals and NPR Music describing it as "an infectious celebration of sexual desire". NPR Music also notes the significance of the song and music video displaying confidence in Sivan's sexuality, writing "[i]t's not every day you see a young, skinny, queer kid get to be completely himself in a music video, and Sivan makes us want to dance along with him." Sivan's first live performance of the song was on 20 January as the musical guest on Saturday Night Live in an episode hosted by Jessica Chastain. Sivan later confirmed that his new album would feature a collaboration with long-time friend Ariana Grande, titled "Dance to This". "Bloom" was released as the third single on 2 May 2018, following "The Good Side". That month, he announced that his second studio album is titled Bloom, while accompanying Taylor Swift as a guest performer at her concert in Pasadena during her Reputation Stadium Tour. The album was released on 31 August 2018. The album's final pre-release track, "Animal", was launched on 9 August 2018. In 2018, Sivan received a Golden Globe nomination for Best Original Song for "Revelation", which he recorded and co-wrote for the film Boy Erased. He was also shortlisted for an Academy Award for the song. In October 2018, Sivan collaborated with British singer-songwriter Charli XCX on the single "1999"; the two also performed the single together live on The Tonight Show Starring Jimmy Fallon. Sivan's music videos frequently feature LGBTQ relationships between the characters. TRXYE's trilogy followed the narrative of two gay teenagers in a secret relationship while "Wild" featured Sivan with another male love interest. His music video for "Heaven ft. Betty Who" features footage of historical LGBTQ movements and couples, as well as sensual shots with him and an anonymous man with the running tagline "Without losing a piece of me, how do I get to Heaven?" and "If I'm losing a piece of me, maybe I don't want Heaven". The singer says these portrayals are important to him, especially when he considers his younger life when he remembers "such vivid memories of the few times I saw any type of LGBTQ relationship on TV or in music videos". In 2007, Sivan starred as Oliver Twist in a production of Oliver! at the Regal Theatre. In 2008, Sivan was cast in a West Australian short film, Betrand the Terrible. In February 2008, Sivan was cast as young James Howlett in X-Men Origins: Wolverine. Sivan got the part after videos of his telethon performance were posted on YouTube, catching the attention of a Hollywood agent who contacted Sivan and asked him to send in an audition tape. Though Kodi Smit-McPhee was already cast for this role, he was unable to be a part of the film, due to his other film, The Road. In July 2009, he auditioned successfully for the lead role in Spud, a film adaptation of the 2005 novel by South African author John van de Ruit. Filming took place in South Africa from early March to mid-April 2010. The film was released in South Africa on 3 December 2010 and was later nominated for six SAFTAs, including a Best Lead Actor in a Feature Film nomination for Sivan. Sivan appeared in the West Australian season of Samuel Beckett's absurdist play Waiting for Godot which opened on 28 May 2010. Sivan shared the role of "Boy" with Craig Hyde-Smith, alternating nights. In June 2012, Sivan returned to South Africa to film Spud 2: The Madness Continues, which was released in South Africa on 21 June 2013. Sivan also starred in the third film in the series, Spud 3: Learning to Fly, released on 28 November 2014. Sivan appeared in the 2018 film Boy Erased, opposite Lucas Hedges, Xavier Dolan, and Nicole Kidman. In September 2012, Sivan began creating video blogs on the video sharing site YouTube, after having only sung on the site since 2007. At the time of posting his first vlog, Sivan had accumulated 27,000 subscribers in his five years since joining YouTube on 1 October 2007. As of April 2016, Sivan had over 4 million subscribers and over 243 million total views across his YouTube videos. His YouTube channel is the third most subscribed channel in Australia, after HowToBasic and Planet Dolan. A YouTube video Sivan made with fellow YouTuber Tyler Oakley titled "The 'Boyfriend' Tag" earned them a Teen Choice Award in the "Choice Web Collaboration" category. Sivan's favourite artists include Amy Winehouse, Taylor Swift and Lorde. MTV Artists also cites Michael Jackson and Frank Ocean as additional influences. Sivan's music has been described as "layered electropop with constant tinges of EDM". His baritone voice has received widespread praise. His work has been compared to Lorde's and Taylor Swift's. Sivan is gay. He came out publicly via a YouTube video on 7 August 2013. He came out to his family three years before his video was released. Sivan is currently in a relationship with model Jacob Bixenman. He lives with a mild form of Marfan syndrome. He resides in Los Angeles. ^ Schneier, Matthew (10 May 2018). "Troye Sivan Is a New Kind of Pop Star: Here, Queer and Used to It". The New York Times. Retrieved 31 August 2018. ^ Spanos, Brittany (29 August 2018). "Review: Troye Sivan Explores Innocence and Experience on 'Bloom'". Rolling Stone. Retrieved 30 August 2018. ^ a b "Troye Sivan: Blue Neighbourhood review – immaculate doses of three-minute emotion". The Guardian. 3 December 2015. Retrieved 11 April 2016. ^ Kheraj, Alim (2 September 2018). "Troye Sivan: Bloom review – thrillingly honest dance pop". The Guardian. Retrieved 6 October 2018. ^ "Troye Sivan". EMI Australia. ^ "troye sivan on Twitter: "IM 21"". Twitter. 5 June 2016. Retrieved 5 June 2018. ^ a b Sivan, Troye [@troyesivan] (14 October 2015). "💙 BLUE NEIGHBOURHOOD – PREORDER OCTOBER 15 – OUT DECEMBER 4 💙" (Tweet). Retrieved 28 May 2018 – via Twitter. ^ "Troye Sivan's 'My My My' Moves to No. 1 on Dance Club Songs Chart". Billboard.com. Retrieved 2 September 2018. ^ a b "Troyesivan18 YouTube Stats, Channel Statistics". Social Blade. Retrieved 11 April 2016. ^ "The 25 Most Influential Teens of 2014". Time. 13 October 2014. Archived from the original on 3 January 2015. Retrieved 3 January 2015. ^ "Australian Boy Does Accents!". YouTube. 17 November 2012. Retrieved 27 June 2014. ^ "Biography". Troye Sivan (Official website). Archived from the original on 26 July 2009. Retrieved 22 January 2014. ^ Law, Benjamin (27 February 2015). "Troye Sivan, the most famous teenager you've never heard of". The Sydney Morning Herald. Retrieved 11 April 2016. ^ a b McLaughlin, Rhett; Neal, Charles (19 April 2014). "Ep. 29 Troye Sivan". Ear Biscuits (Podcast). Retrieved 14 January 2015. ^ Adams, Cameron (2 December 2015). "YouTube sensation Troye Sivan on his debut album, being gay and being a gay role model". news.com.au. Retrieved 8 May 2018. ^ Hall, Jake (19 January 2017). "Troye Sivan on the queer politics of his new video". Dazed. Retrieved 8 May 2018. ^ Frank, Alex (14 March 2018). "Troye Sivan: atomic blonde". Dazed. Retrieved 8 May 2018. ^ "Troye Sivan's Tumblr — How Jewish are you? Like are you orthodox or reform or?". Troyesivan.tumblr.com. 20 September 2012. Retrieved 27 June 2014. ^ Reilly, Gabrielle. "Troye Sivan Interview". The Global Townhall. Archived from the original on 14 January 2015. Retrieved 14 January 2015. ^ a b Symonds, Kristy (7 April 2012). "Perth boy making it big in Hollywood". Perth Now. Retrieved 15 January 2014. ^ a b c d Harvey, Shannon (28 February 2008). "Perth boy to play young Hugh Jackman in Wolverine movie". Perth Now. Retrieved 15 January 2014. ^ "Free Troye Sivan biography | SONG365". Yourmusics.in. Archived from the original on 6 October 2017. Retrieved 6 October 2017. ^ "Troye Sivan's 'Youth' Soars Into Top 40". Fuse. Retrieved 6 October 2017. ^ Caulfield, Keith (27 June 2014). "YouTube Star Troye Sivan Signs With EMI Australia, Announces EP". Billboard. Retrieved 28 June 2014. ^ Stern, Bradley (15 August 2014). "Troye Sivan Shoots To #1 On iTunes (In 55 Countries!) With Debut EP, 'TRXYE'". Idolator. Retrieved 25 September 2014. ^ Caulfield, Keith (15 August 2014). "Troye Sivan Set for Top 10 Debut on Billboard 200". Billboard. Retrieved 25 September 2014. ^ "ARIA Charts – Accreditations – 2014 Singles". Australian Recording Industry Association. Retrieved 15 October 2014. ^ Smith, Michael (5 December 2015). "Album Review: Troye Sivan – Blue Neighbourhood". Renowned for Sound. Retrieved 11 April 2016. ^ Votta, Rae (25 September 2015). "Troye Sivan releases music video for 'Fools,' announces first U.S. tour". The Daily Dot. Retrieved 26 September 2015. ^ "Why Troye Sivan's Martin Garrix Collab 'There For You' is Important for LGBTQ Listeners". 26 May 2017. Retrieved 30 April 2018. ^ a b c "In 'My My My!' Video, Troye Sivan Cements His Image As A Gay Pop Icon". NPR.org. Retrieved 11 January 2018. ^ "Troye Sivan Addresses Online Backlash From Fans: 'The Important Thing Is How You Respond'". Billboard. Retrieved 30 April 2018. ^ "Halsey, Troye Sivan & Chris Stapleton Are 2018's First 'Saturday Night Live' Performances". Billboard. ^ "Troye Sivan Confirms Collaboration With His 'Pop Queen' Ariana Grande". Billboard. Retrieved 4 March 2018. ^ Millar, Jake (13 April 2018). "Troye Sivan GQ Exclusive: "I've Made The Album I Always Wanted To Make"". GQ. Retrieved 14 April 2018. ^ Brandle, Lars (3 May 2018). "Troye Sivan's 'Bloom' is Here: Listen". Billboard. Retrieved 3 May 2018. ^ "Troye Sivan Has Unleashed 'Bloom': Stream It Now". Billboard. Retrieved 31 August 2018. ^ Schneier, Matthew (10 May 2018). "Troye Sivan Is a New Kind of Pop Star: Here, Queer and Used to It". The New York Times. Retrieved 10 May 2018. ^ English, Laura (21 May 2018). "Troye Sivan Reveals New Album Release Date While On Stage With Taylor Swift". MusicFeeds Australia. Retrieved 27 May 2018. ^ Close, Paris (20 May 2018). "Troye Sivan Gives New Album 'Bloom' Release Date, Reveals Cover Artwork". Pop Crush. Retrieved 27 May 2018. ^ "Troye Sivan Unleashes 'Animal': Stream It Now". Msn.com. Retrieved 9 August 2018. ^ "Troye Sivan Unleashes 'Animal': Stream It Now". Billboard. Retrieved 9 August 2018. ^ "Nominations Announced for the 76th Golden Globes". goldenglobes.com. Hollywood Foreign Press Association. 6 December 2018. Retrieved 6 December 2018. ^ "Charli XCX and Troye Sivan Announce New Song "1999"". Pitchfork. Retrieved 21 February 2019. ^ Legaspi, Althea (13 November 2018). "See Charli XCX, Troye Sivan's Laser-Filled '1999' Performance on 'Fallon'". Rolling Stone. Retrieved 21 February 2019. ^ Friend, David (9 November 2016). "Q&A: Troye Sivan on coming out, Canadian popstars". Kitchener Post. Retrieved 16 November 2016. ^ Coyne, Yvette (16 February 2010). "Bertrand the Terrible – LINK funded film". Film & Television Institute (WA) Inc. Archived from the original on 6 July 2010. Retrieved 15 January 2014. ^ Bodey, Michael (5 March 2008). "One for the road clears the path". The Australian. Archived from the original on 3 December 2008. Retrieved 15 January 2014. ^ "Troye plays lead role in Spud – The Movie". Troyesivan.com. 2 February 2010. Archived from the original on 15 February 2010. Retrieved 2 February 2010. ^ "Spud's Young Stars". Screen Africa. 8 March 2010. Archived from the original on 24 May 2010. Retrieved 24 May 2010. ^ Van de Ruit, John (20 April 2010). "Icarus Allsorts". John van de Ruit's blog at Book South Africa. Archived from the original on 24 May 2010. Retrieved 24 May 2010. ^ "2011 SAFTAs: All The Winners". TVSA. 28 February 2011. Archived from the original on 15 January 2015. Retrieved 15 January 2015. ^ "Troye on stage with theatre great". The West Australian. 23 May 2010. Retrieved 6 October 2017. ^ Hatch, Daniel (24 May 2010). "Troye on stage with theatre great". The West Australian. p. 3. Archived from the original on 24 May 2010. Retrieved 24 May 2010. ^ "Troye Sivan to Star in Film About Gay Conversion Therapy". PopCrush. Retrieved 6 October 2017. ^ "Top 100 YouTubers in Australia Filtered by Subscribers – Socialblade Youtube Stats | Youtube Statistics". Social Blade. Retrieved 29 October 2014. ^ Nordyke, Kimberly (10 August 2016). "Teen Choice Awards: The Complete Winners List". The Hollywood Reporter. Retrieved 29 December 2016. ^ "Troye Sivan – Fans, Favorites + Fangirling". PopCrush. 8 September 2015. Retrieved 11 April 2016. ^ "Artist Influences for Troye Sivan". MTV Artists. MTV. Archived from the original on 20 April 2016. Retrieved 11 April 2016. ^ SingersAvenue. "SingersAvenue — Troye Sivan's Vocal Profile". SingersAvenue. Retrieved 12 April 2016. ^ "The Dreamy, Cross-Gender Appeal of Troye Sivan". ELLE. 3 March 2016. Retrieved 12 April 2016. ^ "Something to Tell You about Troye Sivan's 'TRXYE'". Yaledailynews.com. Retrieved 12 April 2016. ^ "Album reviews: Jamie Woon, Troye Sivan and CeeLo Green – after the zeitgeist". The Sydney Morning Herald. Retrieved 12 April 2016. ^ "Blue Neighbourhood – Troye Sivan". AllMusic. Retrieved 12 April 2016. ^ Reed, James (3 December 2015). "Album review: Troye Sivan, 'Blue Neighbourhood'". The Boston Globe. Retrieved 11 April 2016. ^ "Troye Sivan Shows Growth and Growing Pains on Debut 'Blue Neighbourhood': Album Review". Billboard. Retrieved 12 April 2016. ^ "Latest Album Reviews: Troye Sivan, Coldplay, Molly OST, Palms & Ceelo Green". NewsComAu. Retrieved 12 April 2016. ^ "Troye Sivan Gay: Australian Actor Comes Out On YouTube". The Huffington Post. 9 August 2013. Retrieved 15 January 2014. ^ McGrath, Mary Kate. "Troye Sivan's Relationship With Jacob Bixenman Is Too Adorable To Handle". Bustle. Retrieved 22 January 2019. ^ "TROYE SIVAN". Tumblr. 25 January 2013. Retrieved 18 April 2016. ^ Cragg, Michael (17 February 2018). "Troye Sivan: 'There's power in living openly while being gay'". The Guardian. Retrieved 14 April 2018.